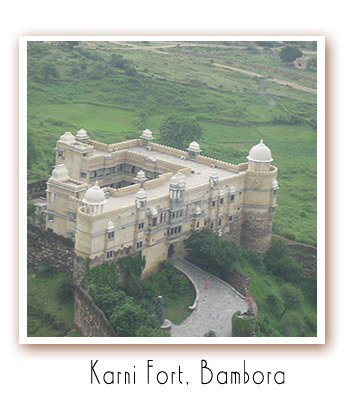 The Karni Fort, Bambora is today available to the discerning and adventurous traveller, to share in its past and partake of its present- the epitome of Rajput hospitality, princely comforts and Aristocratic cuisines. 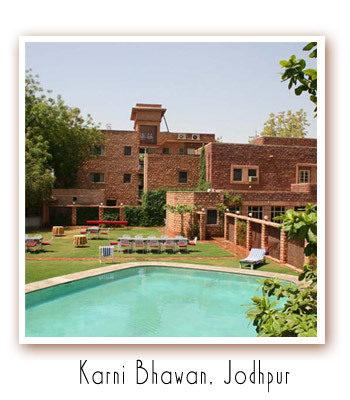 Karni Bhawan, home of the erstwhile Jagirdars of Sodawas, Bhati Rajputs of the Lunar dynasty.This delightful red sandstone bungalow of the 40′s has been sensitively redone to meet the requirement of the discerning travellers. Karni Group of Hotels offer discerning and adventurous traveller, to share in its past and partake of its present- the epitome of Rajput hospitality, princely comforts. All heritage hotels have been sensitively restored to retain its ambience and yet offer modern conveniences. Of great interest is the whole process of conservation and restoration which the owners, Thakur Sunder Singh, his wife Thakurani Chanda Kanwar of Sodawas (Marwar- Jodhpur) and their Aristrocratic family has conducted..